You are here: Home / nutrition / Bananas | Do They Really Make You Fat? Bananas: To Eat or Not to Eat? I’m sure you’ve heard some contradictory nutrition advice about fruits like bananas as it relates to fat-loss. So first of all, fruit doesn’t make you fat. However, there are times (like our famous deplete days) where limiting fruits can enhance fat-loss because it helps deplete liver glycogen and limits excess fructose in your diet. So in some ways fruit is just like “healthy” starches and fats. If you eat fruit excessively, it can potentially block the fat-loss process. That’s why you have to be strategic about it. A perfect example is bananas. It’s a healthy fruit when it’s consumed properly. But you have to careful. along with “how” to eat them the right way. Bananas are an excellent source of vitamin B6 and contain moderate amounts of vitamin C, manganese, and of course potassium. Many articles and research I’ve read also indicates consumption of bananas may be associated with a reduced risk of colorectal cancer. Also, banana ingestion may directly affect the production of dopamine, which is a precursor to the amino acid tyrosine. It’s often used in pre and post workout supplements because of it’s amazing benefits. The banana is very unique. And depending on WHEN you eat it during the ripening process will determine on how it affects insulin and/or fat-loss. 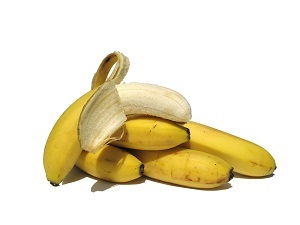 During the ripening process, bananas produce a plant hormone, which indirectly affects the flavor. This hormone (called ethylene) stimulates an enzyme (amylase) that breaks down the starchy component (glucose) into sugar (fructose and sucrose), which makes is taste sweeter. Simply put, the riper the banana the less glucose and more fructose and sucrose (sugar) it will have. So unlike any other fruit, ripe bananas are extremely high in sucrose, which is basically the equivalent of table sugar. This is fine and dandy if your goal is to gain muscle, but mis-timed sugar consumption always = fat storage. So here’s how to handle the banana dilemma if you like them and want to eat them for fat-loss like I do. sugar spike and send your body into a fat storing environment. and maximize recovery. Always include a complete protein in this meal as well. on weight training days and consume only one per day. Just you follow these guidelines, and you can go ahead and enjoy all the great benefits of this fruit – WITHOUT worrying about sugar and fat-storage. make SURE you’re not eating the #1 TOXIC food ingredient on the planet. – and worse, so many of your children’s foods! You keep saying to eat bananas or fruits overall with complete proteins… but do u mean by proteins? i cant be eating fruits with eggs or meat… What other proteins can u combine other than cottage cheese?